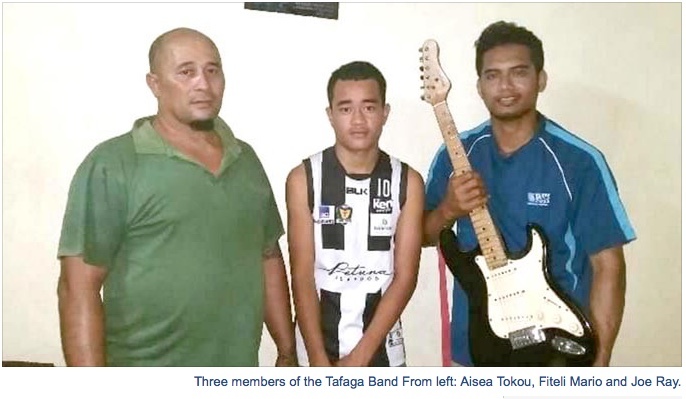 Formed at the beginning of this year, "Tafaga" Band is another name to look out for in the local music scene. Lead singer and guitarist, Joe Ray said, the band was formed after a trip to the Yasawa. The Vatukoula based- band members used to work at the Fiji Island Resort where they jam together as a house band. Joe said the name "Tafaga" derives from the historical adventure of the Rotuman people's voyage throughout the Pacific, on a big canoe that could carry more than 800 men. "One of our band's main aims is to use music as a source of information by sharing with others the Rotuman unique way of life and the culture of the Rotuman people. "We've done original songs and you can find this on our album that was released during Rotuma Day this year," Jo said. Their debut album titled "Tafaga" Chants consists of 12 Rotuman songs. They play anything from jazz, rock, reggae, funk, island music, classic, vude, and even Hindi songs. The six-member band has performed around the country during weddings, birthdays and office parties, amongst others. They have featured with local artists such as Stanley Cakau, Junior Sogovata, George Rasta and Rosie Sagaitu. "What set us apart is our unique culture and the way we expose our music towards it." The band aims to bring Rotuman music to a standard level that will hit the market in a different way. He said some of the challenges were getting gigs in their local areas and also finance when they first started. The long-term plan is to market their album and do more production as well as music videos to expose Tafaga abroad. Joe said upcoming bands should not give-up on what they do best, expose their talents and share their gift to the world. "You never know who you are encouraging and who is looking up to you as a role model," he said. Joe said the starting will be hard, but if you set your mind to it on what you want to achieve you will get it for sure. The band would like to thank their families, friends and their fan base for all the support. So if you're looking for a band to hire for your event then you can contact them on their official Tafaga Band Facebook page and keep updated on the bands upcoming events. Today [10 July] we bid farewell to a valuable member of our team - Niumaia Masere, the District Officer of Rotuma. Niu, as he was referred to by his teammates, passed away while on duty. He served extensively at the forefront of the Fijian Government's rural development initiatives and disaster management operations. He displayed a heart of servitude and always said 'yes' to a challenging task. The Fijian Government's ireguregu to the family was led by the Permanent Secretary for Rural and Maritime Development and National Disaster Management, Mr. Meleti Bainimarama, accompanied by all 4 Divisional Commissioners and other senior government officials. H.E. the President, Joji Konrote, was also present at the memorial service. Antoine N'Yeurt commented that he was a very capable and open-minded leader and helped us a lot for our climate change projects on the island. He will be greatly missed.